KUALA LUMPUR: Damansara MP Tony Pua explained the three major considerations on what went into the development and execution of Budget 2019. "The three major considerations are legacy, solutions, and innovation," announced Tony Pua, who is also the Political Secretary to the Minister of Finance. Legacy remains to be a huge problem for the current government to get over with. In explaining his first point, Tony Pua took pains in expressing the reason why legacy remains a tough challenge to overcome. "The first consideration we had when we did the budget is the legacy, or the state of the finances that we've inherited from the previous government. For example, the RM37 billion worth of tax refund that we had to return to the people of Malaysia. "This RM 37 billion is not our (the government's) money. This is actually the money that we've taken from Malaysian's without asking them first. "So the Finance Minister was very clear, if there's anything we need to return to the people, it is this money," Tony adds. The second priority that the government puts into when developing the budget is on finding solutions for the problems faced. "What we wanted when we developed the budget is to solve key problems. I don't know if we will be able to solve these problems, but we will most certainly attempt to solve these problems," says Tony. "For instance, housing is a big problem, a structural problem. We've asked various parties, like Bank Negara and others to help to rethink this issue, and to think out of the box. "Hence, one such solution was the P2P financing for housing. This is a solution that was innovative in a way that it was never done anywhere else except for one or two places in the world. Do we become conservative and not apply these innovative solutions, or do we try and implement these new and innovative solutions like P2P financing, but do so in a controlled and manageable manner," Tony adds. The third priority is on innovation. The Pakatan government do not want this budget to be merely just 'another' budget. "We don't want budget 2019 to be just another copy-and-paste budget. The normal routine budget development is that it uses previous year's budget, and make changes where it is needed," says Tony. "We wanted to do away with this method of doing the budget. We wanted to find lean ways to do things. Robust conversations like P2P financing for housing was done because we wanted to do things differently. Other things like using REIT to raise funding, and reducing debt was presented. We wanted to be innovative, and ensure that the ideas not just come from the Ministry of Finance. We listened to the private sector, from entrepreneurs, and others," Tony says. 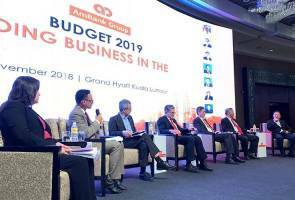 Tony Pua explained the above during the Post-Budget 2019 Forum: Doing Business In The New Malaysia, hosted by AmBank Group. Joining Tony in the forum are Dato' Sulaiman Tahir, the CEO of AmBank; Datuk Jeffrey Ng, Chairman of REHDA Institute, Datuk Michael Kang, the President of the SME Association of Malaysia; Datuk Seri Garry Chua, the President of the Malaysia Retail Chain Association (MRCA); and Jennifer Chang, Tax Partner PwC Malaysia. The forum was moderated by Kamarul Bahrin Haron of Astro AWANI, and the event saw over 800 attendees, most of which are SME business leaders and some Mid-Large Corp leaders.